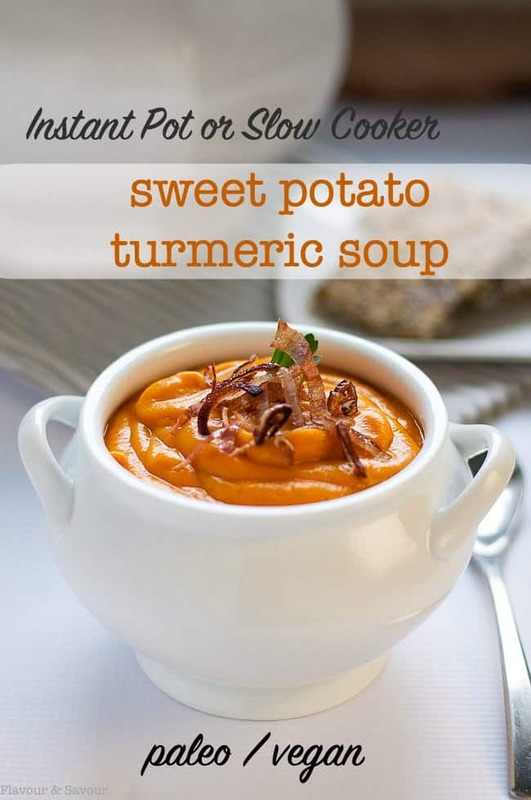 This vegetarian Sweet Potato Turmeric Soup is a little sweet with a bit of a kick! It’s vegan and paleo. We had one of the coldest winters we’ve had in several years here. Are you battling cold and snow? 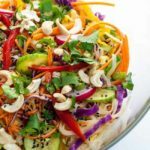 Fighting off colds and ‘flu can be challenging at this time of year, but the foods we eat can certainly help. 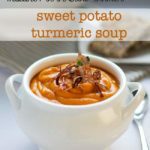 While comforting meals like mac ‘n cheese might sound appealing on chilly days, choosing healthier options, like this sweet potato turmeric soup can go a long way towards building our immune systems and keeping us healthy. Adding hot and spicy comfort foods to my diet is one way I’ve found to beat the cold. This slow cooker soup is sweet and spicy, it’s rich and creamy, and it rates right up high on the comfort level with this Roasted Cauliflower Soup and this Smoky Chipotle Sweet Potato Soup. And if you love the ease of cooking soup in a slow cooker, you’ll love this hearty Slow Cooker Texas Black Bean Soup. Nutritionists tell us to eat other warming food in the winter like ginger, and chili. Yes! 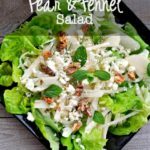 This recipe can be made in an Instant Pot, a slow cooker, or on the stove top. Do you have an Instant Pot? Are you a convert? Like thousands of others, I received an Instant Pot for Christmas. My daughter has been singing its virtues for the past year, so she tucked one under the tree for me. I’ve apparently also been added to the Instant Pot Facebook Group as well! Scanning the frequent posts made me realize just how popular this simple kitchen appliance has become. And for good reason! The Instant Pot cooks food in record time, preserves nutrients, is programmable and easy to use. I suppose you could call it a fancy electric pressure cooker, but it’s so much more than that scary thing my mother used to use to make a stew. I’m always seeking new ways to add turmeric into my diet, even if in small amounts. 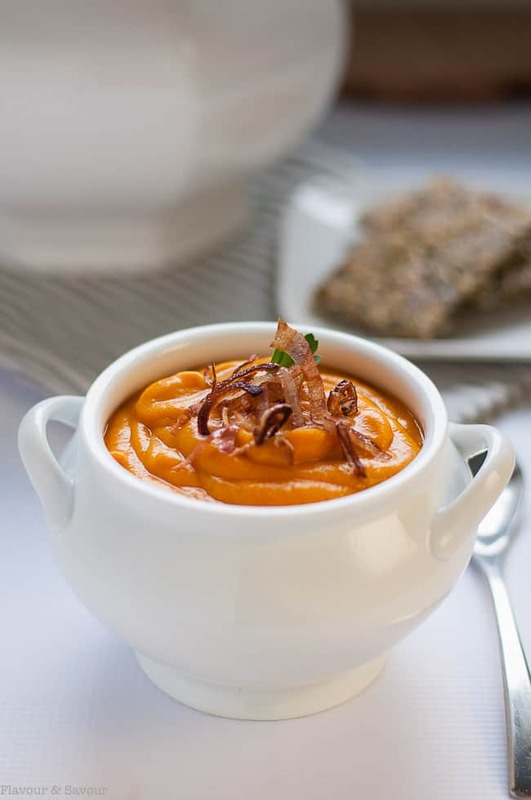 I know it’s a powerful anti-inflammatory and has a host of other nutritional benefits, so stirring even a little to this sweet potato soup seemed like a good idea. It added just enough of a kick to keep this soup interesting. You don’t need an Instant Pot to make this sweet potato turmeric soup. Use your slow cooker, or just simmer in a large pot on your stove top. Any method you use to make it will still produce a warm, comforting bowl of deliciousness! I topped it with a few crispy fried shallots and served it with these healthy homemade seedy crackers. Find more Instant Pot Soup recipe ideas here: 5 Clean-Eating Instant Pot Soup Recipes to keep you healthy. 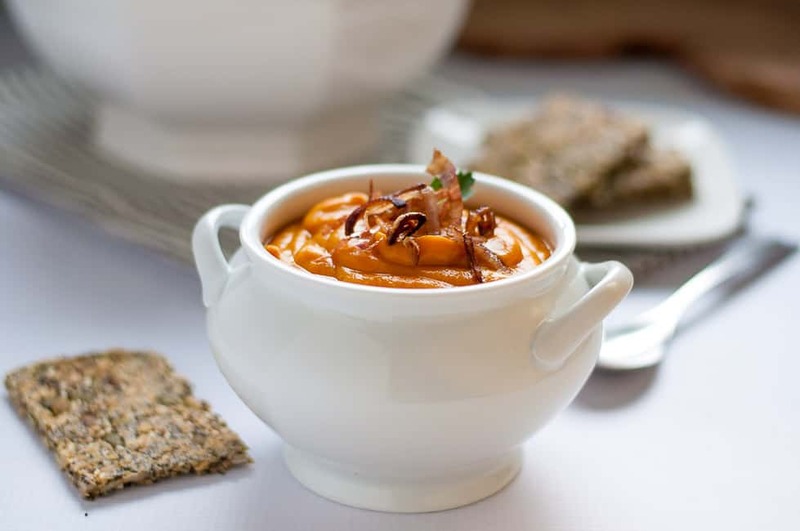 This vegetarian Slow Cooker Sweet Potato Turmeric Soup is a little sweet with a bit of a kick! 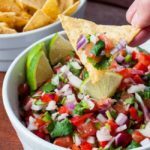 It can be made on the stove top, in a slow cooker or in an Instant Pot. Vegan and paleo. Saute onion, garlic and carrots in oil until onions are translucent. Add sweet potatoes, broth, turmeric, paprika and salt and pepper. Secure lid, set to Manual for 20 minutes. Use the quick release function. Put lid on, cook on high for 5-6 hours or on low for 7-8 hours. Once fully cooked and vegetables are tender, purée soup with an immersion blender or transfer in batches to a high speed blender. To serve, garnish with crispy fried shallots or spiced pumpkin seeds. Freeze in airtight containers. If cooking in an Instant Pot, you may want to reduce the turmeric to 1 teaspoon. 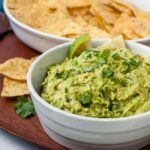 Instant Pots tend to intensify flavours, so 2 teaspoons may be too much. Looking for more ways to add turmeric to your diet? Check the delicious options in this post. I really need to get a hot pot…one more gadget to house! This soup looks really yummy. 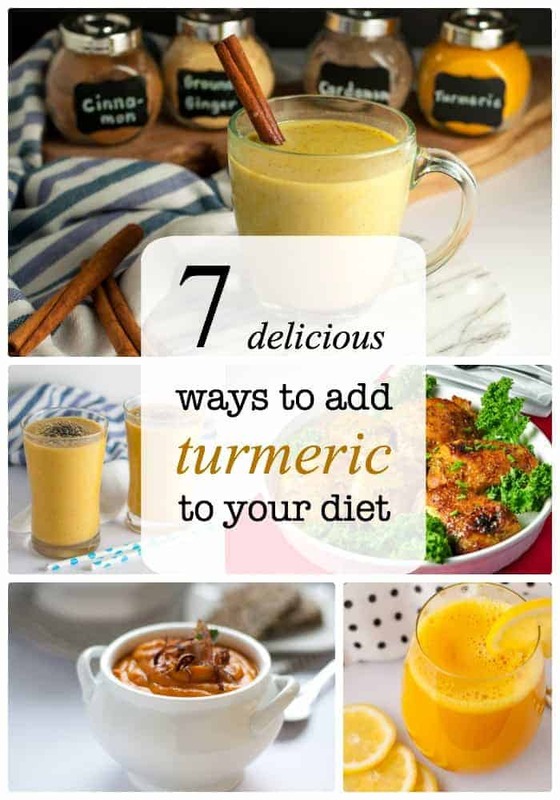 I am always trying work more turmeric into my diet! Hi Elaine! I’m a fellow BC blogger, currently living in Vancouver. 🙂 I also am Instant Pot obsessed. There are so many options but it is definitely best for delicious soups like this one. I also love the benefits of the turmeric. Fingers crossed our weather starts to warm up soon! Hi Sharon, Nice to “meet” you! Yes, love my Instant Pot, too! Sorry for the delay in responding. I was traveling and out of wifi range for a while. Just heading over to “like” your Facebook page! This soup looks so thick and creamy and sounds delicious. I don’t own an Instant Pot, but I’m getting more and more tempted! Hi Colleen, I’m having fun experimenting with mine. Just watch for the sales. It’s a big time-saver as you don’t have to babysit your dishes. Thanks for commenting! I agree, eating earthy helps building a strong immune system. And turmeric is the new Super food. We try to incorporate it in our dishes, too. Here it is such a great addition to an already incredible array of ingredients. Love the look and the ingredients of this soup! I love to try new ways to use turmeric. This soup is one I’ll make again and again. Thanks for stopping by! Looks and sounds delicious. It definitely has been soup winter here on the west coast! Have to try this recipe and thanks for including instructions for both slow cookies and instapot. Great flavours too. Thanks Laura, Yes! It’s been a crazy winter here, although it looks like some warmer temperatures are on their way. It has definitely been soup weather! Pressure cookers have come a long way since then! We no longer have to worry about one exploding in the kitchen!! If this is being cooked in a crock pot, do you still need to saute the carrots, onions, and garlic…. OR do I just throw everything into the pot and set it to cook? 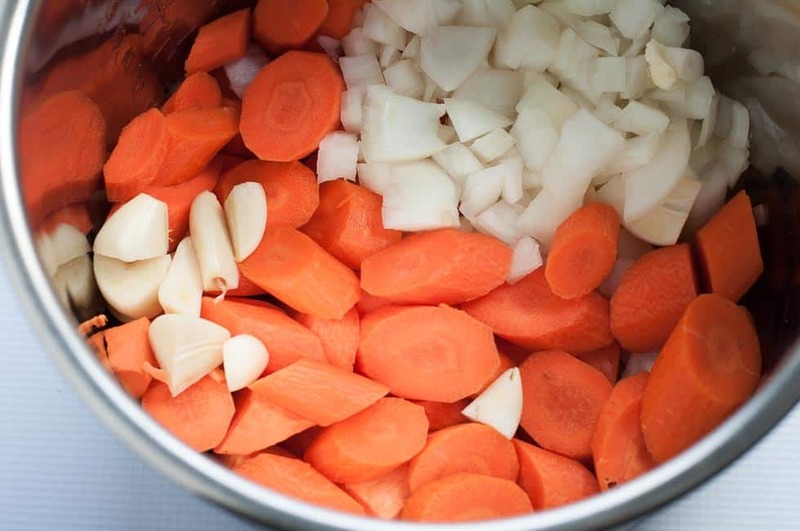 It’s not essential to sauté the carrots, onions and garlic first, because you will purée the soup before serving, but I find that sautéing them first brings out more flavour. Your choice!